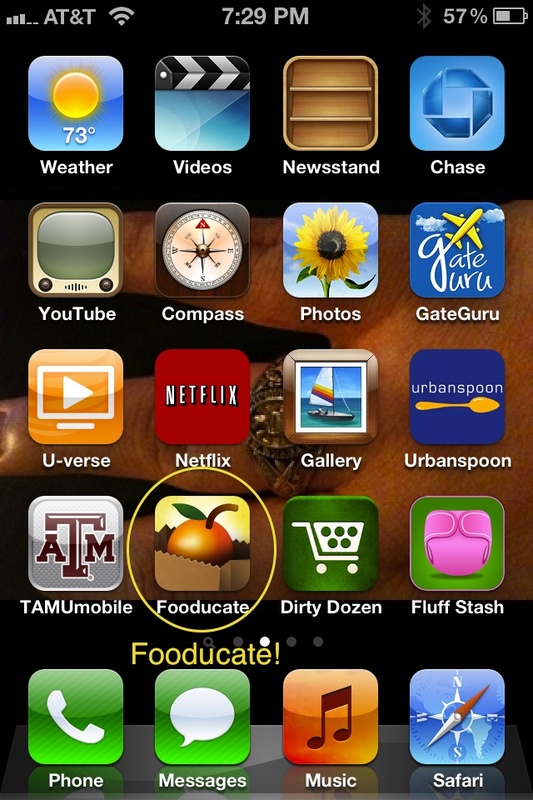 I would like to (hopefully) introduce you to literally the most useful app on my iPhone, Fooducate. Food + educate = Fooducate. 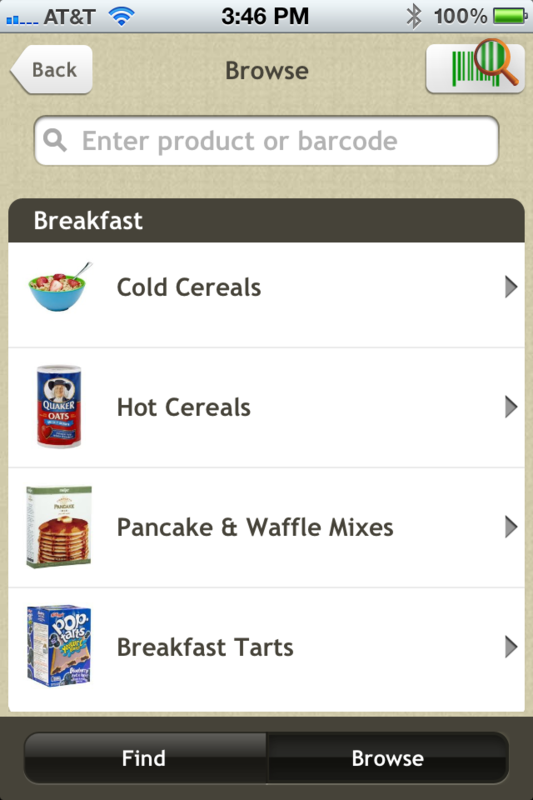 This is a FREE app for Android and iPhone, and it is designed so that the average person who goes grocery shopping can make more informed decisions by allowing you to scan the UPC barcode on a wide variety of products. Here it is on my phone. I keep it next to the dirty dozen app so that I can keep myself organized at the grocery store. 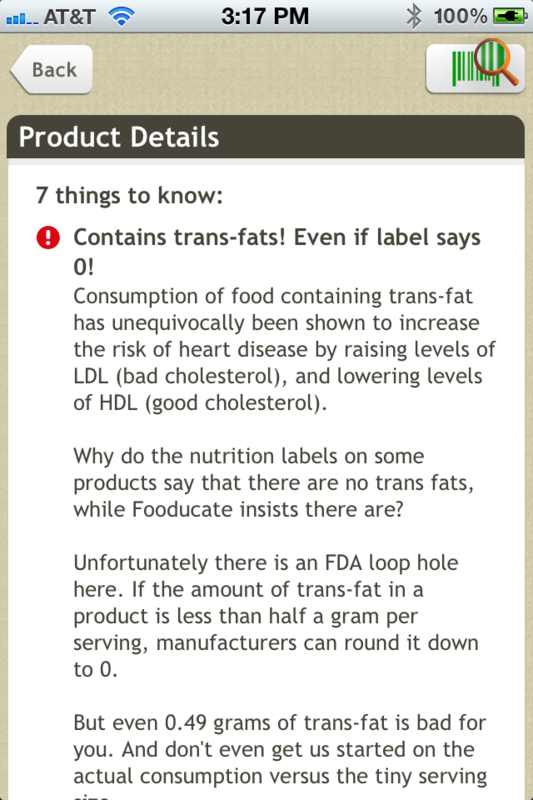 Fooducate is so simple in its design, it’s brilliant. I love it because one of the challenges with eating healthy is finding a diet that fits the modern world. For example, I have seen shake diets, diets where you are restricted to eating food that a certain company makes, and diets where you pop a magic pill that is designed to eliminate fat, and the list just keeps going. The problem that I have with most of those types of diets is that it sets up a situation in which you’re held hostage by these products in order to maintain your waistline. You’re thin and look great while on the products, but the minute you decide to switch back to eating real world food from the grocery store, or you want a piece of cake, bam! Twenty pounds added right back on. Fooducate is great because it allows for making informed, healthy choices while working within real world grocery stores and food options. Its easy, at-a-glance system lets you know quickly whether an item is worth your money or not. First, go to the store where you normally purchase your groceries. 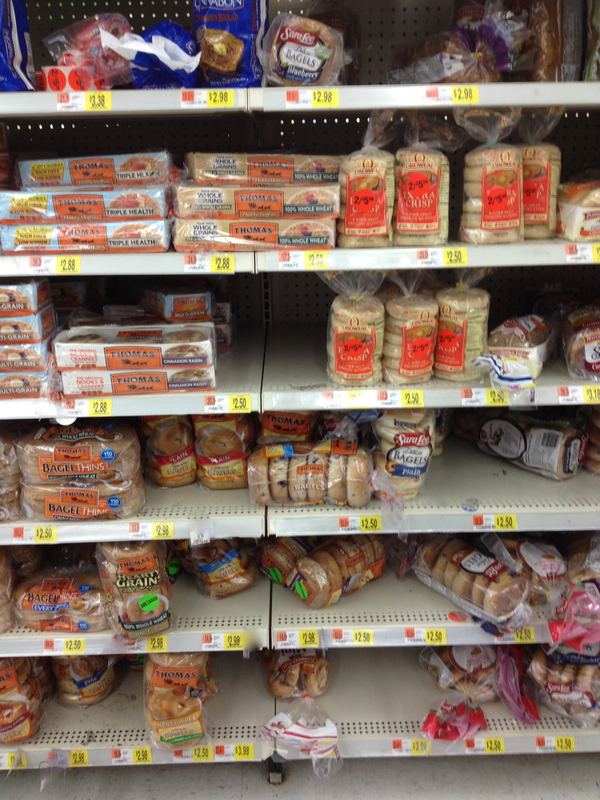 Take the bagel section on the bread isle in the following average store, for example. Now, I am fully aware that bagels aren’t necessarily the best food choice as a whole. I know that bagels contain WAY too many carbs for one sitting, etc. But, on this particular day, I wanted a package of mini bagels to make bagel breakfast sandwiches for breakfast, and I figured this would be better than stopping by a fast food place on my way to work. But, how do I make at least a better bad decision? I fire up the Fooducate scanner. 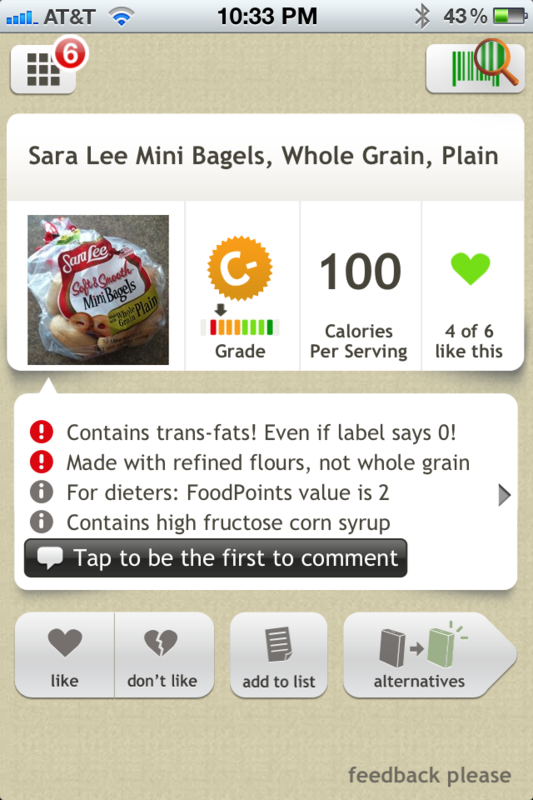 I grab my favorite brand of bagel, and simply scan the code on it using the camera on the phone by lining up the barcode with the little box on the app. I need to say here that this UPC is not the actual bag of bagels I grabbed. 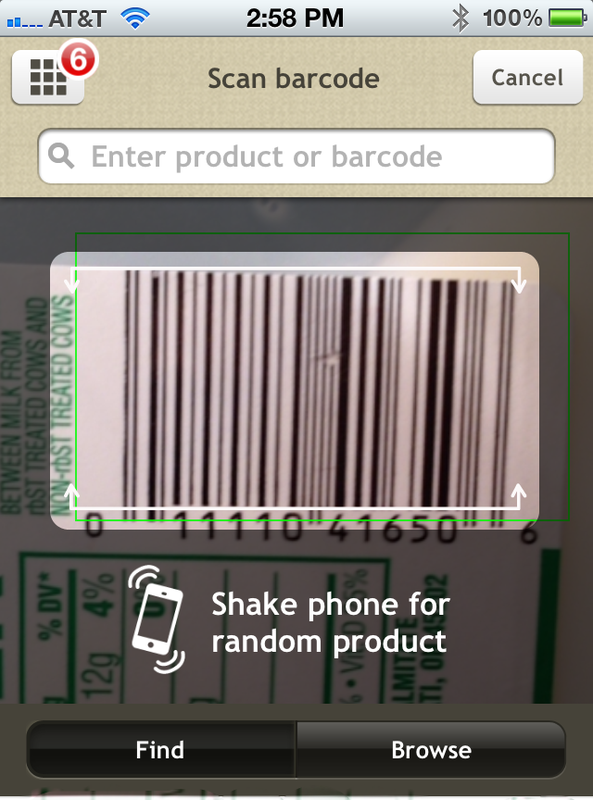 The reason is because once the camera focuses on the barcode, it immediately scans it and getting a screenshot of the barcode in the box is very, very difficult. So, I decided to just go home and scan my carton of milk over and over again until I got a decent shot. This gave me pause. I mean, I knew it wasn’t going to be an A+ or anything, but a C-? Really? Yes. This grade isn’t an arbitrary number the creators of Fooducate came up with to startle somebody into eating 100% organic 100% of the time. An explanation of how they evaluate food can be found here, on their blog. They take into account ingredients, amount of processing, and other factors to generate an easy-to-read grade. 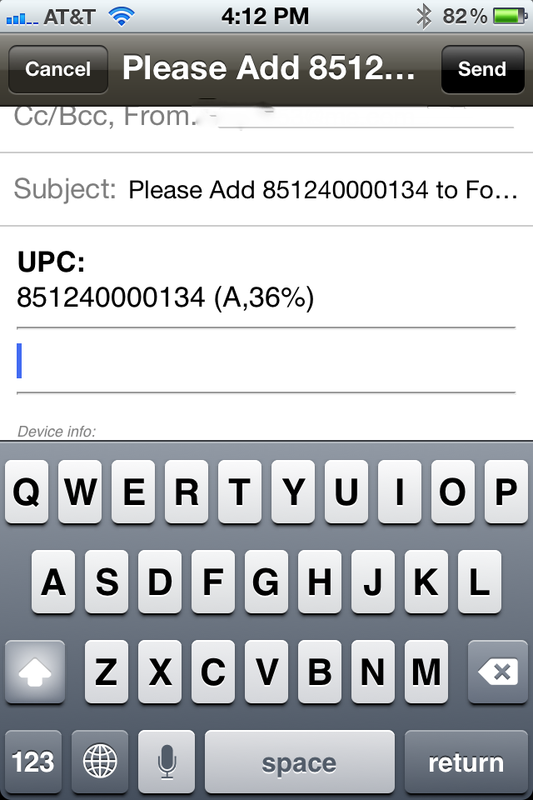 Tapping on the arrow on brings up a bunch of information while maintaining the at-a-glance set up. It shows you exactly how many calories per serving, and where it falls on average. If you keep scrolling down, it tells you the main key points to watch out for in this product and how many food points it’s worth for people on a point diet system. 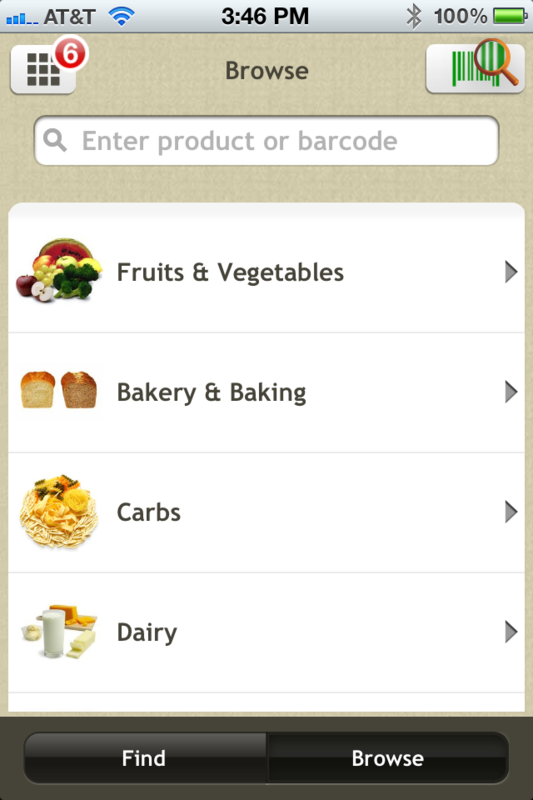 My favorite part of the app though is that it shows alternatives to the food item that was scanned. If you go back to the screen that you get right after you scan it (three pictures up), on the bottom right there is a button that says alternatives. 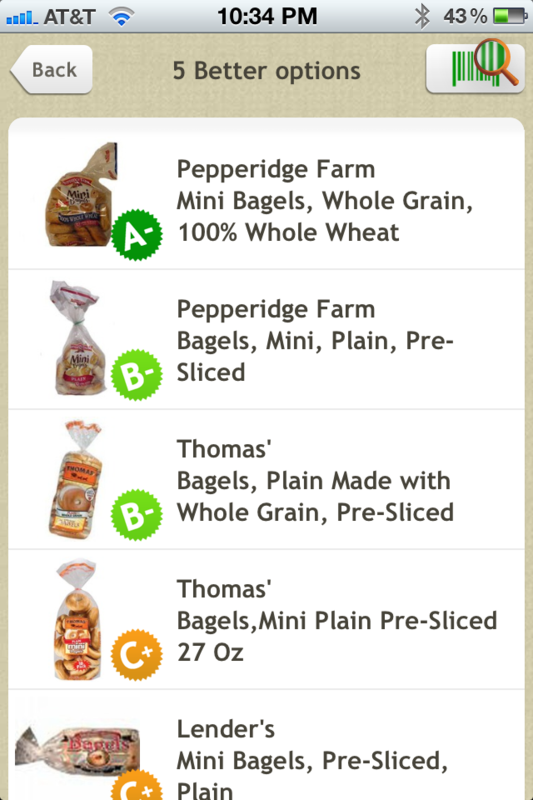 What you get when you tap that is a list of suggestions so that if you choose to select a healthier bagel, you may. The list displays alternatives that have grades all the way from a C+ to an A-. We looked for the A- option, but couldn’t find it in the store. We were able to find a B- option however, and we went home feeling good that we could still eat something that we liked! If you tap on the other options, the food information pops up about those as well so you can know exactly what you’re eating. What Else Can Fooducate Do? 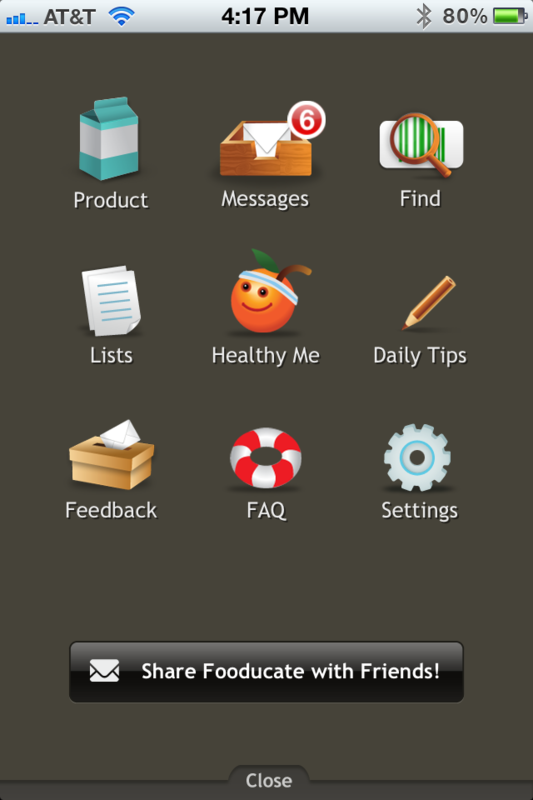 Fooducate has this handy menu that you access from the little checkered looking box at the top left corner. In many of the photos above, it has a little red 6 on it. This menu serves as a dashboard for the app. 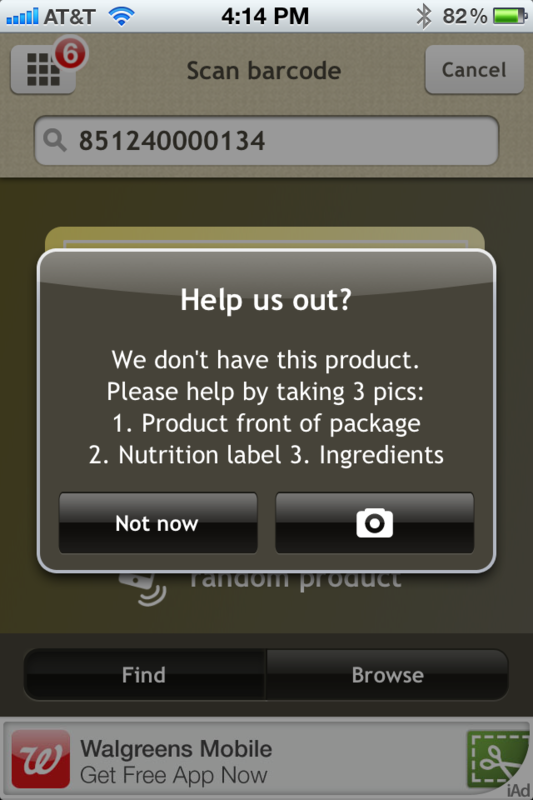 From this dashboard, you can look at the last product that you scanned (product), read messages from Fooducate (messages), and go to the barcode scanner (find). Fooducate routinely offers fun giveaways for scanning certain products, so it’s prudent to check the messages from time to time. I obviously failed to as evidenced by the six messages, and missed some really great opportunities. Next time, I'll be checking my inbox. Duh. Under lists, you can see the history of the things that you scanned and if you sign in you can actually create shopping lists to make grocery shopping an in-and-out event. 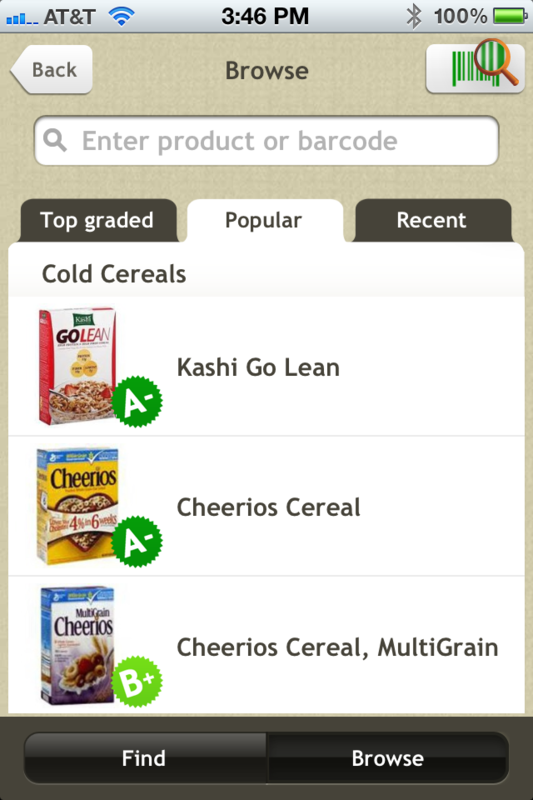 The Healthy Me icon lets you look at the products you have scanned, and see where you fall on average with the rest of the Fooducate users that have scanned products. I really liked this function when I first got the app because I went around scanning everything in my house, and I went back and looked at the Healthy Me list and saw that I was way below average. For example, when I first did it, my grade was an average of a C+. I have brought my average up to a B+ after using this app. I figure if my goal is just to increase the average, it’ll help curb bad eating habits. Daily Tips takes you to the Fooducate blog, where there are always new and interesting articles to read regarding food health and safety. If you go back to the find icon and tap, it’ll take you to the barcode scanner. 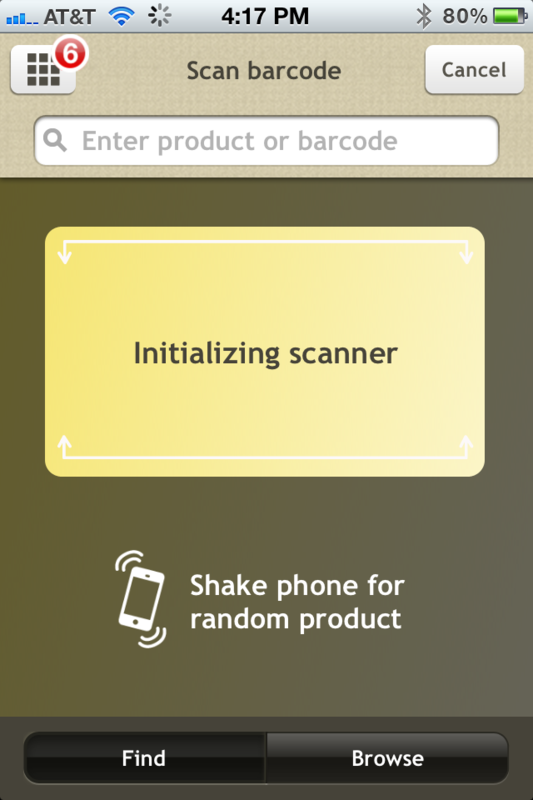 However, if you’re not scanning anything in particular, you can tap browse. The browse function displays a list of categories set up by food type. If you keep scrolling down, tons of food types come up. Today I wanted to play around with breakfast foods, a category listed just a little further down the page. I tapped on it, and it came up with an even more specific list of breakfast choices. and it brought up a list of the top graded cold breakfast foods in the breakfast category. The problem with this is that I don’t have a Publix near me, and I have never seen Simply Fiber in my grocery store at all. The issue was resolved when I went to the popular tab though. Cheerios and Kashi are pretty popular, so that’s much more feasible for me to find at my local grocery. it means you have the opportunity to help build the Fooducate library. I received this message when I scanned my Tropical Traditions coconut oil. I simply followed the directions on the Fooducate app, and when I was done taking all three pictures, it gave me the option to email it in. 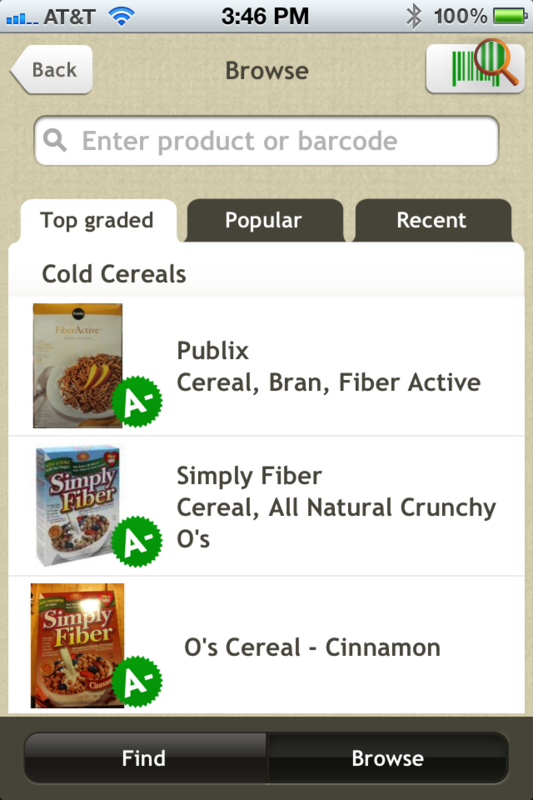 They released their Fooducate Plus iPhone app as well, with a lot more features and no ads. This version does cost $3.99 and I don’t have it, so I’m not a good candidate to review it. I did want to mention it though in case you might be interested. The functionality of the Fooducate app is almost perfect. It is intuitive in its design and it allows me and my husband to make quick but correct (by our standards) decisions regarding our food selections. 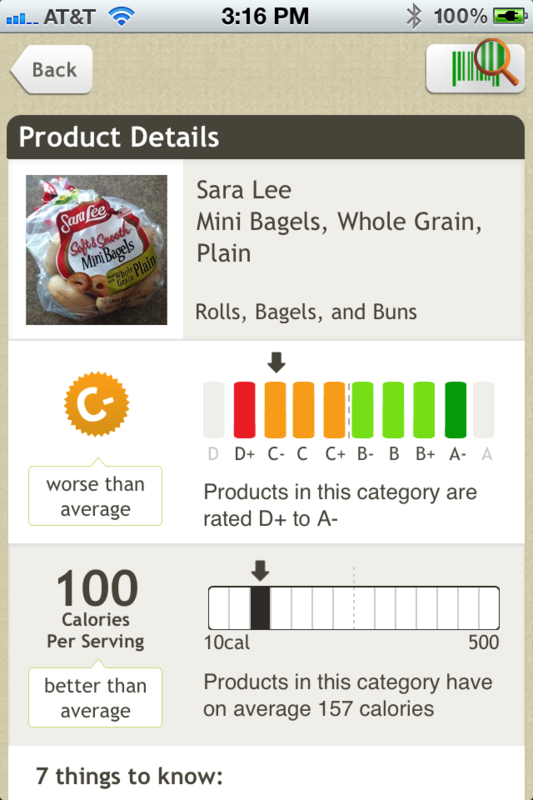 This app makes shopping a lot less of a hassle because I’m not standing there in the middle of the store holding two different types of bagels and trying to compare nutrition labels on the spot. Fooducate has already done that for me. Their website and blog are equally helpful because they are filled with tips and tricks to healthy eating and post pitfalls to avoid with tips on how to avoid them. As far as I know, Fooducate isn’t sponsored by any of the big food corporations, so what you get is information that is updated as frequently as possible. Additionally, they are openly agains the big food corporations sponsoring the American Dietetic Association (you can also read updated information here). This is definitely one of those ideas that I wish I had thought of a long time ago! 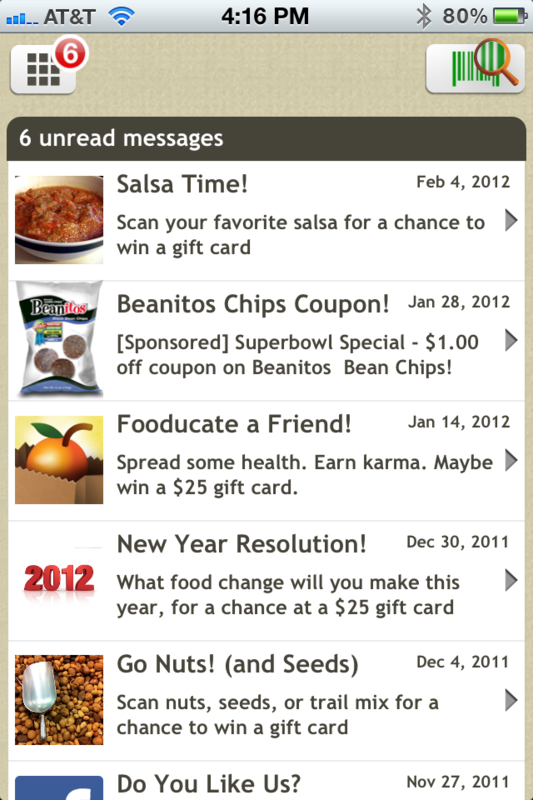 What are your thoughts on the Fooducate app? Is this something you think you would use? What are your thoughts?